Today the program offers opportunities in wheelchair basketball, track and field, swimming and weight lifting. Jordan also is looking to add triathlon to the mix. And, for the first time, the sports will also be featured in events sanctioned by the Eastern College Athletic Conference. Although the program wasn’t launched at Penn State until Jordan was well into her professional career, the seed was planted back in her undergraduate days at San Jose State. As a volunteer with Special Olympics and other similar programs on campus, she often worked with disabled athletes and others with physical challenges. Jordan displays a similar passion toward her current athletes, around 15 at the moment—a number she is always looking to increase, as more and more athletes find out about Penn State’s programs. We caught up with the coach late last fall, as she supervised a practice for Brett Gravatt, Baren Berg, a former wrestler who was injured during a deployment, and a handful of other athletes. Penn Stater: How busy are you with the Ability Athletics program? Teri Jordan: We are really busy. October was tremendously busy with the program with Diversity Awareness Month. Every weekend we were busy. (Also this year) the ECAC Conference is now putting in three events for disability into the conference: swimming, track and field, and wheelchair basketball, and we have all three programs. I have only one swimmer, but maybe Brett will be my second swimmer. … We have a lot of quality athletes and we have a lot that are just participating to be the very best they can be. PS: What role did Penn State play in getting the ECAC to adopt sports into the conference? TJ: Hopefully we will be the leaders of it since this is the first year. I, myself, have met with all the ECAC head people. … What they’re going to do is integrate us right into the able-bodied track meet. And the able-bodied swim meet. So it’s not a matter of when—it’s happening. It’s just a matter of how many other schools will be there. We’re one of the leading programs in the country for track and field. University of Illinois has more wheelchair track runners. They have no field events. We’d probably kill them with all the field event points but they’d kill us with all the wheelchair track events. So at this point I don’t know if Illinois or us would win. And I understand Illinois is coming into the ECAC next year, just because they want to compete against us. PS: Do you ever see a day where this is incorporated into Big Ten? TJ: Oh, yeah. I think that’s probably in the next two years. PS: How do athletes get to the program? TJ: (One way is) we went to the junior national event last year with Brett, because Brett’s so young. … At that junior national meet, we met all the top junior high school athletes in the county. PS: What is biggest hurdle to overcome with athletes and potential athletes? TJ: I don’t have any that think it’s too hard. All these guys want an opportunity to compete. It may be tough on them, but if they want to get good they’re gonna work hard. PS: What kind of feedback do you get from families of these athletes? TJ: They seem to just see a difference in how happy their athletes are and all that. They’re very pleased with where they’re at. PS: Do you ever think of your role in their rehabilitation and recovery? TJ: They inspire me. I could retire age-wise and years of service, but I’ve always wondered why people paid me, because I come to play instead of work. But there’s days when I know it’s work. But they inspire me every day. Entry filed under: Athletics, From the Magazine, Uncategorized. 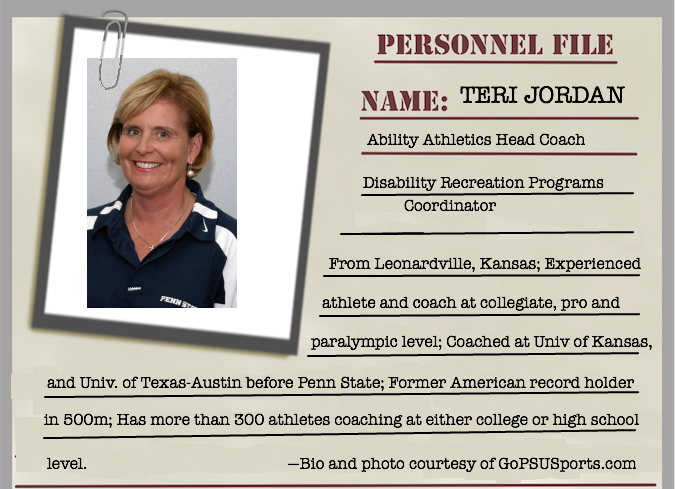 Tags: Ability Athletics, Baren Berg, Brett Gravatt, Penn State, Teri Jordan, Tim Curley.